Essential tremors (ETs) are one of the commonest movement disorders. Tremors have been considered to be 'benign' but this nomenclature has been abandoned due to the emergence of recent evidence of the functional and psychological disabilities associated with ETs. However, ETs remain a poorly understood entity till date. There is a recent suggestion that ET may be a manifestation of a neurodegenerative disorder resulting in cognitive decline and cerebellar dysfunction apart from the classical postural and action arm tremors. The occurrence of infarct in the precentral region, thalamus, striatum and cerebellum has been reported to ameliorate ETs in the contralateral limbs. We report a 55-year old male patient who had postural tremors in both his hands since the age of 20 years and had amelioration of tremors in his right hand following a left striato-capsular infarct. A 55-year old male patient had a history of tremors of both his hands since the age of 20 years. Tremors were fine, symmetrical, involving both his hands, that appeared on maintaining posture against gravity and interfered with his writing. He had sudden-onset slurred speech with clumsiness in the right hand 1 month ago that improved within one week. Following this recovery, he noticed that tremors in his right hand had disappeared. He was hypertensive and was on medications. There were no other co-morbidities. His mother had a history of tremors in both her hands. On examination, he was conscious and oriented. There was no dysarthria. He had mild right pronator drift. He had postural tremors in the left upper limb only [Video 1]. There were no other neurological abnormalities. Complete hemogram, renal, liver and thyroid function tests were normal. 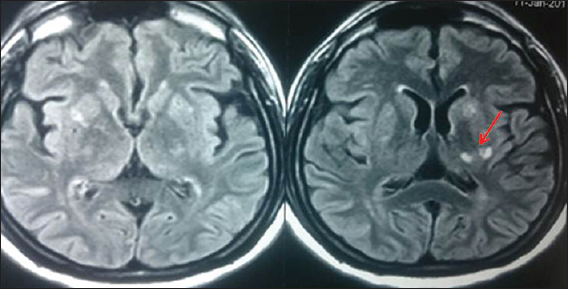 Brain magnetic resonance imaging (MRI) showed a hyperintense lesion in the left striato-capsular region [Figure 1]. Carotid Doppler and two-dimensional transthoracic echocardiography were normal. He was started on propranolol and had improvement in his symptoms. The pathogenesis of ETs is of a central origin. Aberrant oscillations in the olivo-cerebellar circuit have been implicated in the generation of abnormal rhythmic motor activity. In patients with ETs, neurodegenerative changes have been seen in the cerebellum with a selective loss of Purkinje cells and signs of their axonal swelling and degeneration with formation of axonal torpedoes. Purkinje cells, Golgi interneurons and basket cells, as well as dentate nucleus (where the cerebellothalamic pathway originates) are GABA-ergic neurons and their intracerebellar output is inhibitory. Diminished cerebellar gamma-aminobutyric acid (GABA)-ergic tone causes reduced inhibitory cerebellar outflow with resulting excitatory cerebellar output. Medically refractory ETs are being treated surgically by targeting the ventral intermediate nucleus (ViM) of the thalamus. Thalamic deep brain stimulation (DBS) has been used to disrupt the abnormal cerebellar-thalamic-cortical outflow that is hypothesized to be involved in the ET pathogenesis. Kim et al., (2006) reported a patient with essential tremors who spontaneously improved after a sensorimotor stroke related to a small cortical infarct near the left precentral region of the brain. They postulated the presence of cortical or transcortical motor loops that are likely to be involved in ETs and suggest a possible link with the cerebellar-thalamic-cortical pathway. There are reports of amelioration of ETs in the contralateral limb following occurrence of infarct in the precentral region, thalamus, pons, striatum and cerebellum. Dupuis et al., in 1989, reported a patient with ETs in whom tremors disappeared on the right side after a homolateral cerebellar infarct. They reported that vascular and surgical lesions of the dentorubrothalamic pathway improve various kinds of tremors including ETs. Urushitani et al., in 1996, reported disappearance of essential neck tremors after a pontine base infarction. Nakamura et al., in 1999, reported a patient with ETs wherein the tremors disappeared after a thalamic infarction. Choi et al., in 2008 reported disappearance of resting tremors following a thalamic infarct in the tubero-thalamic territory. Constantino et al., in 2003 reported the unilateral disappearance of ETs after the development of a cerebral hemispheric infarct. Kim et al., in 2006, reported disappearance of writing tremors after a striatal infarction. Chalah et al., in 2015 reported a patient with permanent reversal of essential tremors following a frontal lobe stroke. They postulated that the ischemic stroke could have interrupted the cortical component of the ET network, leading to the cessation of tremors. Our patient had disappearance of right hand ETs following a left striato-capsular infarct. The amelioration may have been be due to the involvement of the cerebello-thalamo-cortical loop fibers traversing the internal capsule. Lesions anywhere in the cerebello-thalamo-cortical loops tend to ameliorate ETs in the ipsilateral or contralateral limbs. Lesions in the internal capsule also ameliorate ETs, as demonstrated in our patient. Benito-León J, Louis E. Essential tremor: Emerging views of a common disorder. Nat Clin Pract Neurol 2006;2:666-78. Lorenz D, Deuschl G. Update on pathogenesis and treatment of essential tremor. Curr Opin Neurol 2007;20:447-52. Hedera P. Emerging strategies in the manangement of essential tremor. Ther Adv Neurol Disord 2017;10:137-48. Kim JS, Park JW, Kim WJ, Kim HT, Kim YI, Lee KS. Disappearance of essential tremor after frontal cortical infarct. Mov Disord 2006;21:1284-5. Dupuis MJ, Delwaide PJ, Boucquey D, Gonsette RE. Homolateral disappearance of essential tremor after cerebellar stroke. Mov Disord 1989;4:183-7. Urushitani M, Inoue H, Kawamura K, Kageyama T, Fujisawa M, Nishinaka K, Udaka F, Kameyama M. Disappearance of essential neck tremor after pontine base infarction. No To Shinkei 1996;48:753-6. Nakamura Y, Miura K, Yamada I, Takada K. Disappearance of essential tremor after thalamic infarction. Rinsho Shinkeigaku 1999;39:340-2. Choi SM, Lee SH, Park MS, Kim BC, Kim MK, Cho KH. Disappearance of resting tremor after thalamic stroke involving the territory of the tuberothalamic artery. Parkinsonism Relat Disord 2008;14:373-5. Constantino AE, Louis ED. Unilateral disappearance of essential tremor after cerebral hemispheric infarct. J Neurol 2003;250:354-5. Kim DH, Kim J, Kim JM, Lee AY. Disappearance of writing tremor after striatal infarction. Neurology 2006 25;67:362-3. Chalah MA, Ayache SS, Riachi N, Ahdab R. Permanent reversal of essential tremor following a frontal lobe stroke. J Neurol Sci 2015;15;354:133-4. Mailankody P, Netravathi M, Pal PK. Review of tremor in Parkinson's disease and atypical parkinsonian disorders. Neurol India 2017;65:1083-90.